"If you visited Maddie in the hospital, you would've thought you were visiting someone at summer camp." Of all of the miracles that graced our journey, none stood taller than the first one – her journey from paralysis to miraculous. On April 21, 2018, our then two-and-a-half-year-old daughter, Maddie, underwent an emergency surgery to remove a rare cancerous tumor from her spinal cord. Her diagnosis and surgery without warning. She went from a healthy, happy, spunky little child, to a patient undergoing a six hour surgery to save her life. As we waited for her to emerge from her surgery, we didn’t know whether she would survive, and if she did, what would be left of our little girl. Well, not only did Maddie survive the surgery. But despite emerging paralyzed on the left side of her body on account of the tumor as well as the surgery itself, in just a matter of two weeks, Maddie quickly returned to her dancing, smiling, and happy self. We will forever cherish this miraculous emergence. Maddie’s story is a real life inspirational story of holding on to love, light, and life in the face of grief, darkness, and death. 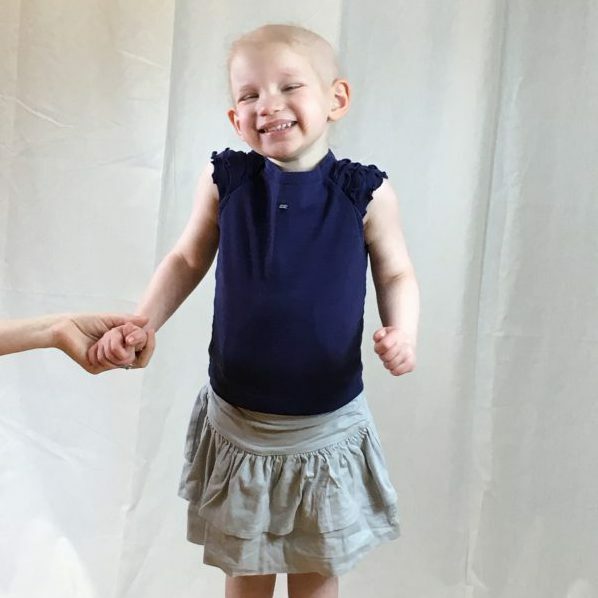 Despite being stricken with one of the rarest and harshest cancers and chemotherapy protocols, Maddie never stopped bringing her toddler innocence to her cancer journey. If you visited Maddie in the hospital, you would’ve thought you were visiting someone at summer camp. A room filled with decorations, musical instruments, wall decals, stickers, books, and music, this was Maddie Kramer’s neighborhood and cancer wasn’t about to bring her down. Maddie figuratively and literally danced her way through cancer. With childhood cancer in particular, we want the world to know that life does not stop with cancer. Children are so incredibly resilient, innocent, and playful, and those same characteristics are what carry them through their treatment process. All too often I think we reduce children with cancer to the images we may see on commercials. But ultimately, they are just children…special, amazing, dancing, playing, heroic children.